then a teenager, became determined to help. At the age of 20, Khaled, alongside three other computer engineer graduates at the Menoufia University, created a wearable belt with a Bluetooth-connected headset for the blind and visually impaired. The gadget leverages RGB imaging and infrared depth data captured through a 3D depth camera enabling movement and navigation in a safe, quick and easy manner. At the same time, it allows those wearing it to recognize the most common objects and obstacles they face in their daily life, such as chairs, doors and staircases. Object-recognition is signaled through vibrations, which are transmitted to a bracelet worn by the blind or visually impaired person on his hand, while audio instruction is sent through a headset. Even though this was Khaled’s team graduation project, they decided to take it to the next level, by making it a technology-based new startup, called Mubser, to provide cutting-edge new technologies that could support millions of blind and visually impaired people. For them, one of the key goal was to make the device affordable, especially in Africa and other developing parts of the world, where the visually impaired have a real and urgent need for this type of solutions. Khaled believes that combining entrepreneurship and technology is essential in integrating the blind and visually impaired people in society and, more generally, in improving people’s lives. Though young, the Egyptian entrepreneur has already developed a formula for success: passion for solving a problem, commitment, and listening to experts’ ideas and advice. In order to ensure that the device is useful to the blind and visually impaired, Mubser partnered in September 2013 with Mada, a non-profit organization focused on connecting people with disabilities to the world of information and communication technology, which helped test and customize the product. Khaled and his team are already working on an improved version of the belt gadget. For a subsequent model, they intend to connect the camera to social media and the Internet to allow facial recognition of known individuals that the blind or visually impaired person might interact with. The gadget would inform its wearer of the identity of known individuals prior to them starting to talk. In an interview, Khaled stressed that this improvement was conceived, so as to enable the visually impaired to start a conversation, instead of having to wait for their counterparts to introduce themselves. The young Egyptian entrepreneur hopes to have this new version available in several months. While Khaled has managed to successfully build his company, he has also faced some obstacles on his way. One of the major challenges has been manufacturing, because the manufacturing industry is not well-developed in Egypt, while the country’s current political instability added further economic impediments. 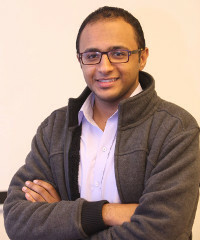 As Mubser was incubated at the Venture Lab at the American University in Cairo, one of the largest incubators in Egypt, Khaled received valuable advice on manufacturing from mentors from other countries. Khaled and his company have been awarded numerous accolades. In 2013, the Egyptian entrepreneur was selected as a finalist for the Anzisha prize, which celebrates young African entrepreneurs who are using entrepreneurship to solve the problems in their communities. In 2014, Khaled was chosen as one of the ’30 Most Promising Young Entrepreneurs in Africa 2014.’ His company has won many awards that have come with financial prizes as well, which validate the originality and usefulness of the young entrepreneur’s idea. Mubser won first place at the Intel Business Challenge Egypt, in the IbTIECar competition, where the prize was given by Microsoft Egypt, and the I2P (Idea to Product) Brazil in the ICT Track. All of this prizes have allowed Khaled and his team to constantly improve their product, and, thus, to best serve the visually impaired.